A new generation of Non-Linear Junction Detectors introduced in 2013 ushered in a digital spread spectrum, 2.4 GHz model called ORION 2.4. The ORION 2.4 provides an FCC, CE and IC compliant product for detecting and locating hidden or obscured electronics. Now REI has released the ORION 2.4 HX with a grip molded touchscreen display and the choice of 3.3 watt or 6.6 watt transmit power models. The HX touchscreen display is molded into the polycarbonate grip handle for displaying graphical data, antenna responses and operational controls. Programming on the new display provides features not available on other NLJDs. The Frequency Adjust screen (Fig A) displays an active graph of the 2nd, 3rd, and transmit frequencies. 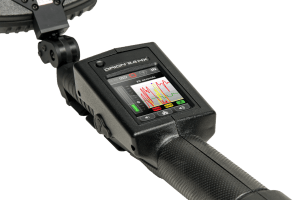 When the ORION 2.4 HX is powered on, the synthesized transceiver automatically searches for and selects a quiet transmit frequency to avoid signal interference. The transmit signal can also be manually selected on this screen by tapping the desired frequency on the graph. Arrow keys at the bottom of the graph provide fine tuning adjustments. Selecting ‘Auto’ commands the system to automatically select a quiet transmit frequency and displays the results. The Histogram Display (Fig B) shows a time based history of the transmit power level (green), 2nd harmonic (red), and the 3rd harmonic level (yellow). Chart durations can be displayed in 10, 20, 30 or 60 second spans. A Bar Graph (Fig C) displays 2nd, 3rd, and Transmit power and receiver responses, similar to the antenna head display. Transmit power is increased and decreased using the touchscreen display. 2nd and 3rd harmonic threshold settings can also be adjusted on the display. The 2nd and 3rd harmonic bar graphs are similar to all ORION NLJDs – a stronger 2nd (red bar graph) indicates a semiconductor, and a stronger 3rd harmonic indicates corrosion. Screen captures of ORION 2.4 HX charts can be saved for reporting and analysis by selecting the camera icon at the top right side of any screen. The HX will save and store the screen shot to the Micro SD card supplied with the unit. The ORION 2.4 HX also has a USB connection for firmware updates. An NLJD is used to detect and locate electronic devices, regardless of whether they are switched on (active) or off (inactive). They can be used to look for hidden illicit electronic devices. Transmit power level on the ORION 2.4 HX is specified in average EIRP (Effective Isotropic Radiated Power) and is available in a 6.6 W* or 3.3 W model. The 3.3 W model is FCC authorized. The 6.6 W model is only available for use by persons, agencies, or entities not restricted by FCC and CE. Transmit power and the larger 1.25 MHz bandwidth of the ORION 2.4 HX increase sensitivity and puts more detection energy on an object at a given time. The 2.4 GHz digitally modulated spread spectrum signal provides increased detection range, and interference avoidance. High speed DSP (Digital Signal Processing) and a wideband digitally modulated transmit signal make response time near instantaneous, while improving detection. The antenna head has the same line-of-site bar graph display as the standard ORION 2.4, which shows transmit power, 2nd, and 3rd harmonics. In addition to the visual response, the ORION™2.4 HX also provides selectable audio and haptic (vibration) responses when a potential device is encountered. An alert threshold can also be selected to only allow audible or haptic responses beyond defined levels. The compact antenna head can access relatively small areas and is circularly polarized for signal reception regardless of the antenna’s orientation. The transceiver provides frequency stability and agility to automatically search for clean operating frequencies between 2.404 GHz-2.472 GHz. Receiver sensitivity to both 2nd and 3rd harmonics is -140 dBm. 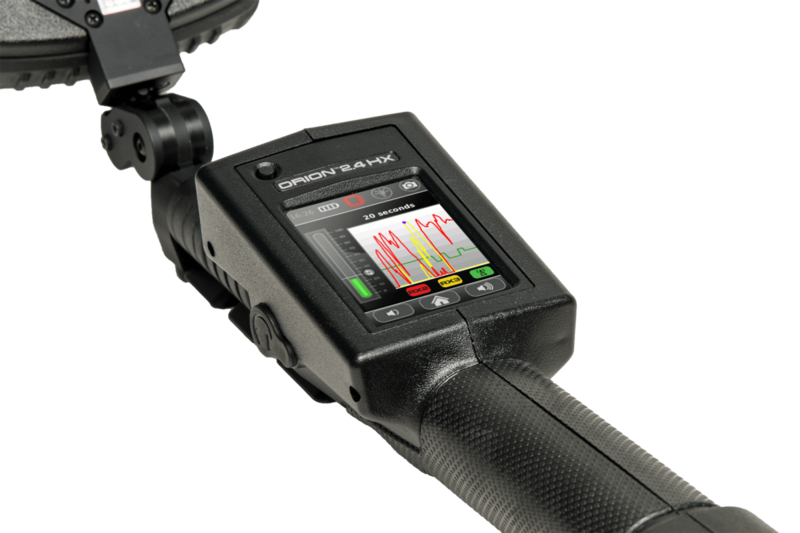 The higher power 2.4 GHz digital spread spectrum signal, the touch screen display, and the reporting data available with the HX model offer considerable enhancements to the new generation ORION 2.4.